About: I was so excited when Forbrain - Sound For Life LTD sent me a package with their bone conduction headset! Forbrain used technology to enhance your language by using your own voice to stimulate your brain. How cool is that?! 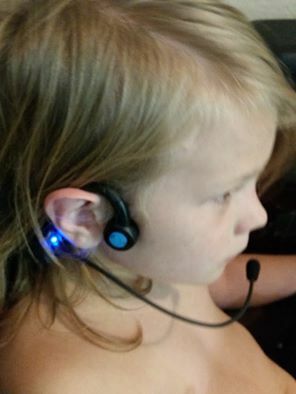 The headset is designed to be able to use with children as young as 5 years old and even as old as the adults as well. Since Forbrain has many uses it can help at many levels for those different age levels. It comes in a nice protective case that holds the headset as well as the charger. Also included is the user manual, quick start guide, and 3 spare mic covers. There is also a 2 year warranty for the headset. When fully charged the battery will last approximately six hours. For correct placement you will want to make sure that the earpiece is on the bone in front of the ears. This is very important as this is how the headset works. The recommended usage is to use daily. For young children use 15 minutes a day, for older teens and adults use 20 minutes a day. I mainly used this with my son who has a speech impediment. When he went to pre-k in a public school he was given speech therapy for it. We never had much luck with the whole repeating of words and trying to hold his mouth in the correct way in order to get him to say the words or sounds correctly. He also has ADHD so it is hard to get him to sit and focus on much at one time. I really enjoyed this because he thought it was cool to wear it and hear himself. It also was nice because it did not actually add anytime to our studies, just a couple seconds to put the headset on. He just wore it while we did some of our other work. Usually when we were working on learning our letter sounds and sight words. That way when we would say them after me he could hear himself. So we do put it on daily but usually he will keep it on longer than the 15 minutes. I think it has helped him because not only is he hearing how he is saying things better to correct himself he is also blocking out the outside sounds around him making him be able to focus more and not pay attention to those distractions. Which is huge for him because normally he would nit pick at the little noises around to interrupt us. I think that this would be a great tool for anyone that needed some speech, memory, singing, reading, auditory, or focusing help. I love to sing myself and did try it on once to see how well it did with singing. I don't like hearing myself when it comes to and audio system as it makes me feel like I sound off. I was very pleasantly surprised at the clarity that it had and I could actually hear pitches well and it made me feel confident. I didn't want to use it much more so that we could focus on him using it, but I plan to try it out more for myself as well. I could very well see someone using this to aid in their singing lessons. Be sure to check out what my fellow crew members had to say about it. See how their kids used it and how it may have helped them.